Orange County is taking steps to prevent the return of homeless encampments at the Santa Ana Civic Center and Riverbed, which were permanently cleared earlier this year. Today, the Orange County Board of Supervisors approved $1.6 million for supportive housing services for homeless individuals that were removed from the Santa Ana Riverbed and Civic Center. In March, the county cleared 13,950 needles, 400 tons of debris and 5,279 pounds of hazardous waste from the Riverbed encampment. Under an agreement with the Illumination Foundation, the county will provide funding for a minimum of 60 people to receive temporary housing at a motel while searching for long-term independent or supported housing in the community. Individuals will receive access to meals, transportation and storage facilities. Homeless individuals that participate in the program will be required to sign and adhere to a code of conduct that spells out behavioral expectations in order to receive the housing assistance. “Orange County will continue to provide help for people that want to get back on their feet and take control of their lives,” said Supervisor Do. Last month, county officials removed 234 people from the Santa Ana Civic Center Plaza of the Flags. More than 700 people were removed from a homeless camp along the Santa Ana Riverbed in February. Since July 1, 2017, the County and its contractor, City Net, have contacted 1,182 individuals from the Santa Ana Riverbed and Civic Center about assistance services, of whom 58 percent accepted help. 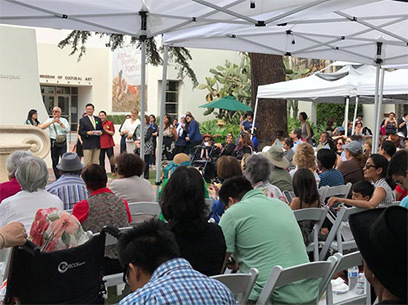 On Sunday, Chairman Do attended the Drawing Out Stigma Multi-Ethnic Arts and Family Festival hosted by the Multi-Ethnic Collaborative of Community Agencies (MECCA) at Bowers Museum in Santa Ana. 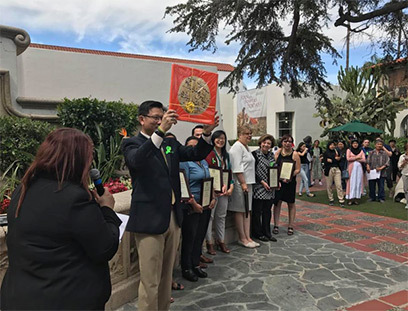 The annual Drawing Out Stigma event focusses on eradicating undue stigma surrounding mental illness and mental health treatment in communities across Orange County. Over 4,000 people gathered to see the featured artwork created by community members of different cultural backgrounds who have experienced mental health issues. Art exhibits were accompanied by live performances and ethnic foods. The exhibition increased awareness for those who have suffered from a mental health issue and to make other community members more comfortable in seeking help for possible mental health issues they may have themselves. Chairman Do spoke of the importance of reducing mental health stigma, especially in ethnic communities where a recent CalOptima Member Health Needs Assessment found it is a significant barrier to treatment, and thanked all those involved for their dedication to making that goal a reality. 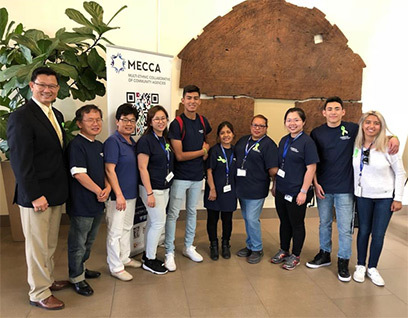 Organizations involved included Abrazar, Inc., Orange County Children's Therapeutic Arts Center, OMID Multicultural Institute of Development, Korean Community Services, The Cambodian Family, Southland Integrated Services, Inc., and Access California Services. 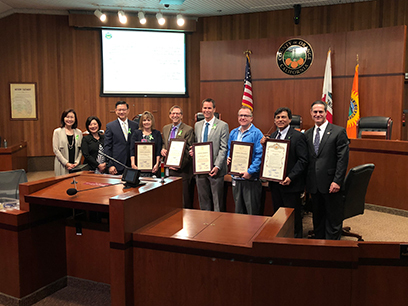 At Tuesday’s meeting, the Orange County Board of Supervisors declared May as Mental Health Awareness Month in Orange County. 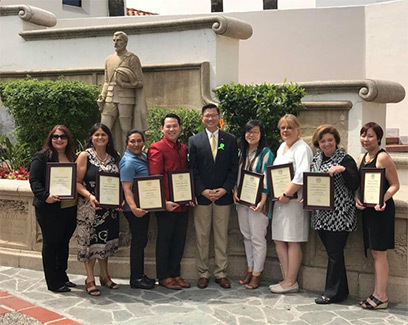 Chairman Do presented a resolution to the Orange County Health Care Agency’s Outreach and Engagement Team, commonly referred to as “Blue Shirts”, for their role as the boots-on-the-ground team helping those with mental illness access services. The board thanked staff who had performed outreach at the Flood Control Chanel and Civic Center to homeless individuals for their hard work and dedication ensuring people have access to crucial mental health services throughout the County. Chairman Andrew Do invites you to wear a green ribbon or wristband in commemoration of Mental Health Awareness Month and to start conversations with friends, family, and co-workers about mental health in order to reduce stigma. 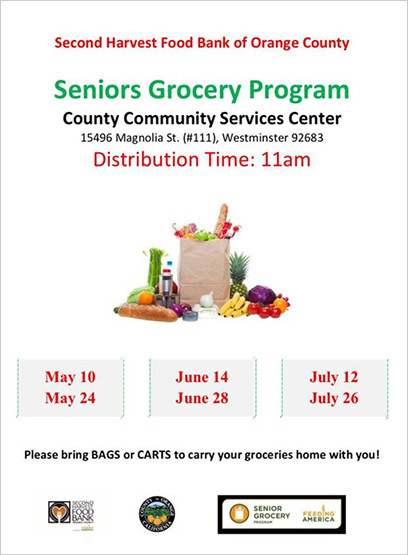 Second Harvest Food Bank of Orange County will be at the County Community Services Center in Westminster on the following dates at 11am distributing FREE groceries through the Senior Grocery Program. If you or someone you know could utilize this helpful program, please see the attached flyer for more information. You are currently signed up to the 1st District newsletter. To unsubscribe, click here.